Donohue Peak from South flank of Donohue Pass. We've hiked to the center of the Sierra Nevada at Tuolumne Meadows from Lake Tahoe. Our long hike down the North Sierra along the Tahoe to Yosemite Trail has ended at Tuolumne Meadows. 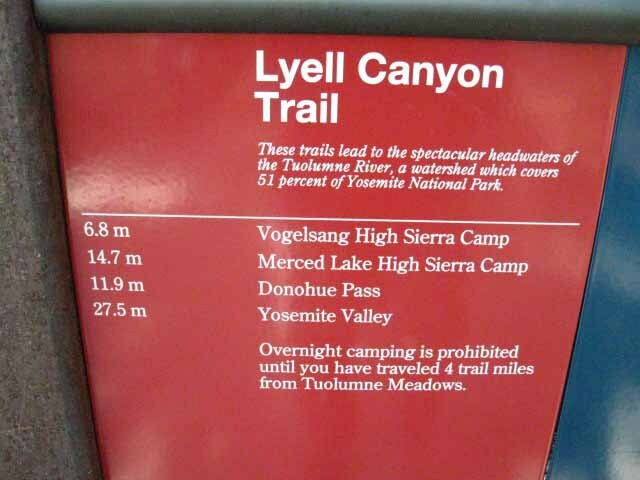 The South end of the TYT at Tuolumne Meadows marks the point where it is replaced by the John Muir Trail as the companion trail to the Pacific Crest Trail down the South Sierra as the TYT was in the North Sierra. 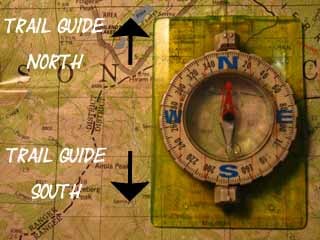 Those of us continuing South down the JMT from Tuolumne Meadows are either Tahoe to Whitney hikers continuing down the Sierra Crest or JMT hikers arriving at Tuolumne Meadows after finishing their massive climb out of Yosemite Valley. The long gentle climb up Lyell Canyon terminates in a brutal climb to the Southern boundary of Yosemite National Park at Donohue Pass. 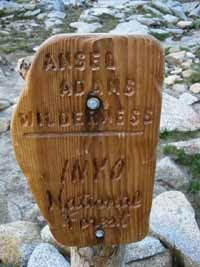 We exit the Yosemite Wilderness through Donohue Pass to enter the Ansel Adams Wilderness of the Inyo National Forest. of Inyo NF at Donohue Pass. This rather short section of trail between our Tuolumne Meadows and Reds Meadow resupply spots is anything but short. The terrain between Tuolumne Meadows and Reds Meadow is chock-full of local peaks to climb, incredible granite scrambles and explorations around/to isolated lakes and some of the most beautiful seculded places I have ever seen. I have hiked from Tuolumne Meadows to Reds Meadow using one full day, overnight at my favorite lake near Island Pass, and then down to Reds Meadow well before Noon the second day of hiking. That is just crazy! #1> There is a small lake sitting surrounded by golden sands off to our South from Donohue Pass. #2> The meadows running from the South base of Donohue Pass to where we begin the climb up to Island Pass are other-worldly. One need to linger through these meadows of moss, rock, and whitebarks along the granite banks and tranquil pools of Rush Creek. #3> The terrain on the South side of Island Pass all the way up to Catherine Lake and the backside way up Banner that would take me decades of High Sierra backpacking trips to really explore. I refer to the terrain to the West of the JMT from Island Pass South to Banner Peak. This is just incredibly beautiful terrain full of physical and experiencial treasures. Go explore it. And we have not even explored the triple-split of the trails South of Thousand Island Lake, where the JMT stays high up on the granite West wall of the Middle fork of the San Joaquin gorge, the PCT breaks off to hike on the West wall, and a third trail, the River Trail, runs down the middle of the canyon to Reds Meadow between them. The JMT stays up in the stunning series of granite and forest encrusted lakes stashed in granite folds in the terrain on the West side of the Canyon of the San J river while the PCT runs South down the barren, exposed East flank. The sweet River Trail goes right down the middle between the JMT and PCT, following the river down through very soft river-bottom soils under nice shade to Reds Meadow Pack Station. My favorite, the most beautiful, and the hardest of the three trails between Thousand Island Lake and Reds Meadow is the John Muir Trail, by far. I prefer the JMT route over this small barren length of the PCT anytime, even if I had not walked either before, and even if I had already walked the JMT and not the PCT. That is how much superior this segment of the JMT is than the route of the PCT from Thousand Island Lake to Reds Meadow.